Discover the Edinburgh of the 1890s with this blog post from Jane Charlotte. Sarah Snow is the main character in my novella Captive Moon. She lives in Victorian Edinburgh, a city which in some ways is unchanged from the place it is now, but in others is unrecognisable. Here are a few old images that show what life in Victorian Edinburgh was like. 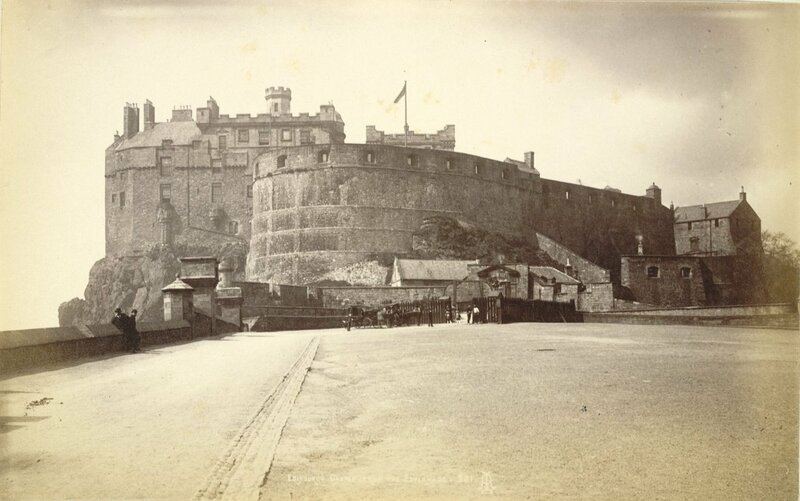 Edinburgh Castle: Here’s a photo of Edinburgh Castle taken from the Esplanade, some time between 1865-1895. During this time period the Castle underwent some physical changes, like the restoration of St Margaret’s Chapel and the Great Hall, and the creation of Argyle Tower and the lower gatehouse. In Sarah Snow’s time the Castle would have been used as a military barracks, and wasn’t home to the musuems and attractions it is now. The famous One O’clock Gun would have been familiar to her though, as it fired for first time from Edinburgh Castle in 1861. 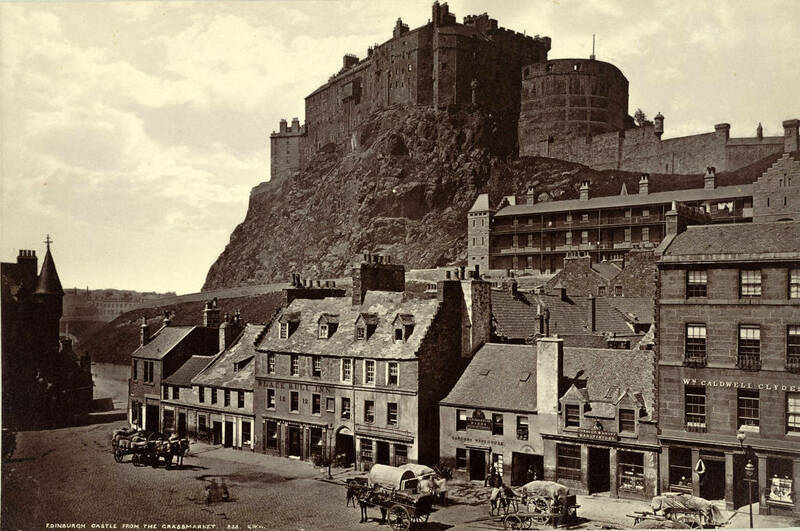 The Grassmarket: This photo of Edinburgh Castle from the historic Grassmarket was taken by George Washington Wilson some time between 1865-1885. It’s another very familiar silhouette to people who know contemporary Edinburgh, with the looming Castle, Black Bull Inn, and even the tenement buildings. In Sarah’s day it was a poor area in the Old Town which was home to a regular market, and had been the site of some infamous public executions – as well as near the home of murderers Burke and Hare. 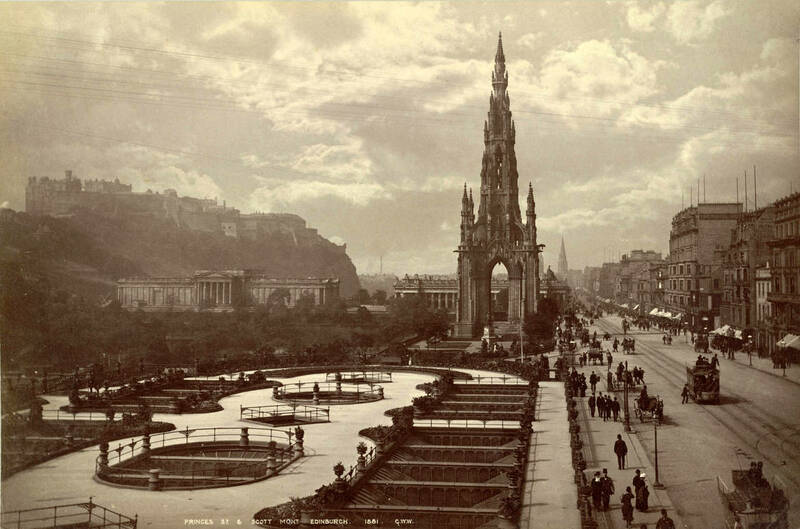 Princes Street – in another photo by George Washington Wilson, we can see Princes Street, the imposing Sir Walter Scott Monument, the Gallery of Art and distant Edinburgh Castle. Taken in 1881, this shot provides a good glimpse of the everyday lives of Edinbugh residents in Sarah Snow’s time. Fashionable hats and long dresses for the ladies, suits, hats and canes for the gentlemen. People walking or using horse drawn carriages, trams, and bicycles to get about. Busy store fronts with people shopping for goods on Princes Street, just like they do today. 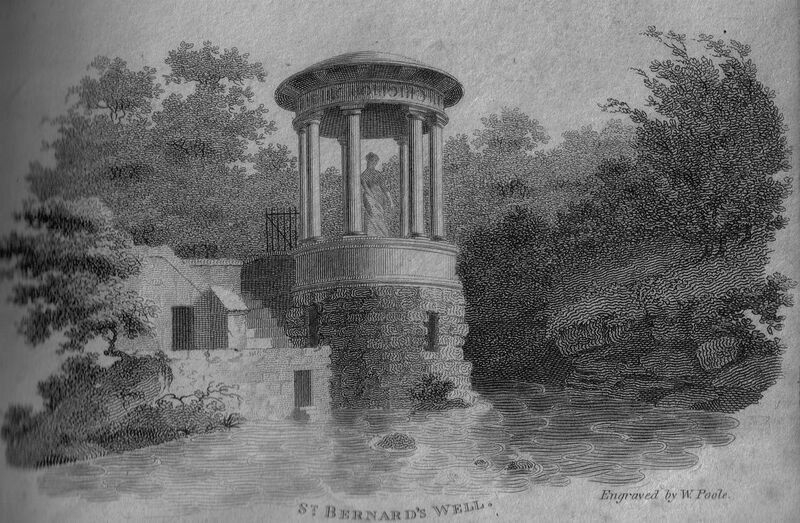 St Bernard’s Well: a place visited by Sarah Snow in Captive Moon, St Bernard’s Well in Edinburgh New Town hasn’t changed much with the passing of time. The mineral spring was thought to restore people to health. This engraving by W. Poole shows the Well in 1800 – taking the form of a Greek temple with a statue of Hygieia, the Greek goddess of health. In 1884 the Well was presented to the people of Edinburgh after restoration and the addition of a new statue of Hygieia, so Sarah Snow would have seen something very like the above. Stockbridge: Sarah Snow lives in the genteel New Town of Edinburgh, which has Stockbridge at its heart. 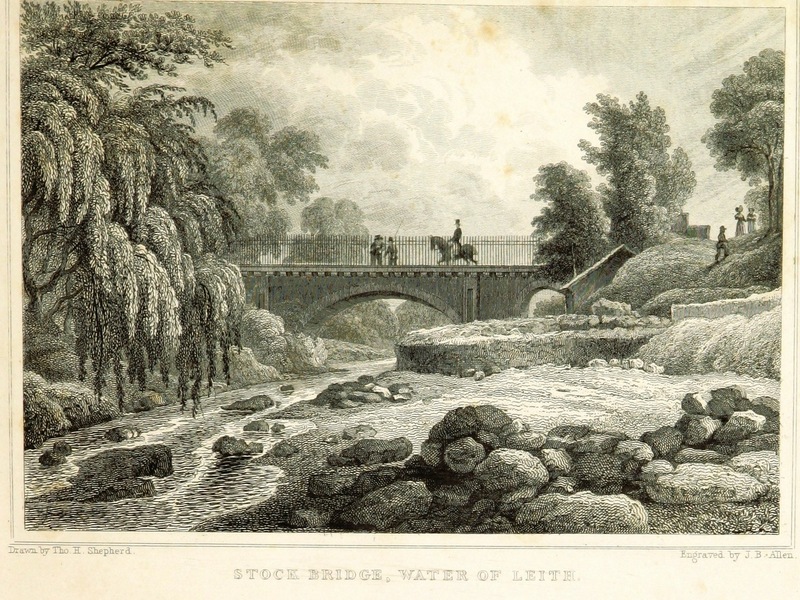 This drawing by Shepherd shows a very gentle view of the Water of Leith in Stockbridge – a body of water that runs through many parts of the city. The fashions of the men and women in the drawing show that it’s a little before Sarah’s time, but she too would have been able to enjoy a stroll by the river. If you liked these, check out my Captive Moon Places board on Pinterest, as it shows lots of other photographs from Victorian Edinburgh, and where you can find them today. If you’re a fan of historic Edinburgh, you can purchase Captive Moon on Amazon now.